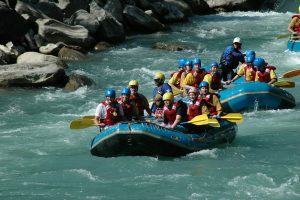 Trishuli rafting is the most popular whitewater tour of Nepal. It is appropriate for all from the first time to experienced rafters. This rafting is a good opportunity to experience the pristine natural beauty, scenic valleys, impressive gorges, unpolluted beaches, exciting rapids and easier sections. Trishuli River originates from Gosainkunda, the Himalayan Lake north-west of Kathmandu. According to a legend, Lord Shiva created three springs by piercing his trident into the rocky mountain. Since these three springs are the sources of water for the river it is named after Trishuli River. The best season of Trishuli Rafting is from February to May and September to Mid December. June, July, August is monsoon period in Nepal. In monsoon due to high water volume and high rapids, it becomes difficult to organize rafting trip. Excellent Himalaya Trek & Expedition organize Trishuli River rafting trip in group joining and private basis both. Group Joining fixed departure trip are available almost every day. For the private trip, it needs minimum group size of 4 pax and above. Morning you will be transferred to Kathmandu Tourist bus station. Drive to Charaudi, 85 km away from Kathmandu and 4 hrs drives. Move to rafting start point. Before rafting our guide briefs you on the raft and river. Wear on life jacket and helmet. Then set off water journey. We stop for lunch. Further continue it until arriving at Fishling, the rafting ending point. After that, we drive back to Kathmandu. Day 01: Morning you will be transferred to Kathmandu Tourist bus station. Drive to Charaudi, 85 km away from Kathmandu and 4 hrs drives. Move to rafting start point. Before rafting our guide briefs you on the raft and river. Then set off the journey. The trip hits a few 2 or 3 grade of rapids. We stop for lunch. Further, continue it until arriving at Kuringhat. Dinner. Overnight stay at the camp. Day 02: After tea and breakfast we continue white water trip hitting class of 2 or 3 rapids named “BIJILI RAPID” and “TEAPOT” and stop for the lunch. After that, we finish our white water journey at Simaltal. Then drive back to Kathmandu. Please contact us for any further information, price and booking of Trishuli Rafting.